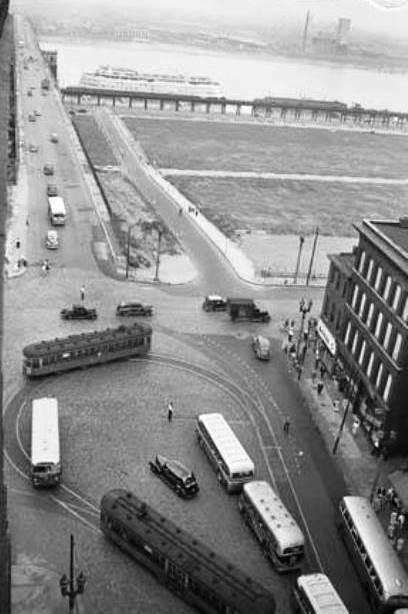 Today’s photo offers a unique perspective of Washington Avenue, approaching the Eads Bridge in 1942. The streetcars and buses look like toys – one might expect a kid’s hand to come down to maneuver them around the loop. There’s the SS Admiral on the river. The excursion steamboat was only two years old at the time. Note the barren land at right. The historic structures that once stood on the current Arch Grounds began to tumble in 1939. By the time this photo was shot, the area was mostly raised, save the Old Courthouse and the Old Cathedral. The Arch itself would take another quarter century to be completed. Click here to read more about the long process from conception of the memorial idea to completion.